Baking day | Where have the days gone? Today was the bake sale at church to raise money for White Cottage at Glade Run, so I spent the day yesterday baking (recipes follow). Of course, first it took an hour and a half to get the kitchen cleaned up after a week of not really having time to both cook dinner and clean up after it. Then I had to heat up some lunch for 2. Then of course the molasses cookies require a cup of cold coffee, which means I had to make some more coffee and sit down with the extra cup and some leftover butternut/apple bake Al made on Friday, and read my mystery book for a while (currently a German translation of an American author’s series about an Italian detective…). Then I made each of the doughs. After eating the beet soup & an Italian platter (bread, proscuitto, fresh mozzarella, kalamata olives, arugula, mmm), I finally got started rolling, cutting, and baking, first the Goldsternchen, then the molasses cookies, whilst running downstairs intermittently to watch the Penguins game. Everything was baked by the middle of the 3rd period, so I watched the end of the game, which went into OT, and then at 10:30 finally started filling and icing. To bed around midnight, pretty well exhausted after a full day in the kitchen. 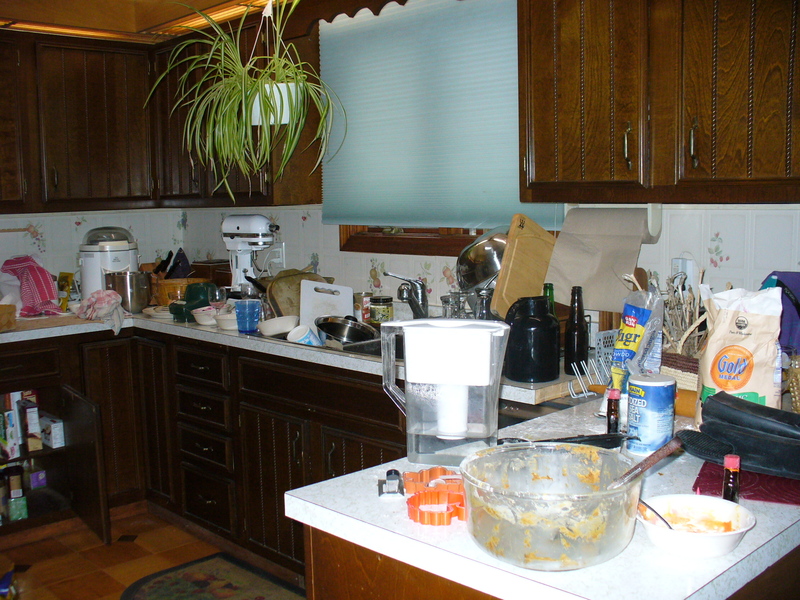 As I recall, mom used to bake all her Christmas cookies in one mad day – I have no idea how she did this! Here’s what I woke up to this morning, but it was worth it. Allow to cool completely before filling. To make the filling, stir the preserves and the water together. Put a little bit on the bottom of a cookie, then place another one on top, so the two un-egged sides are pressed together. 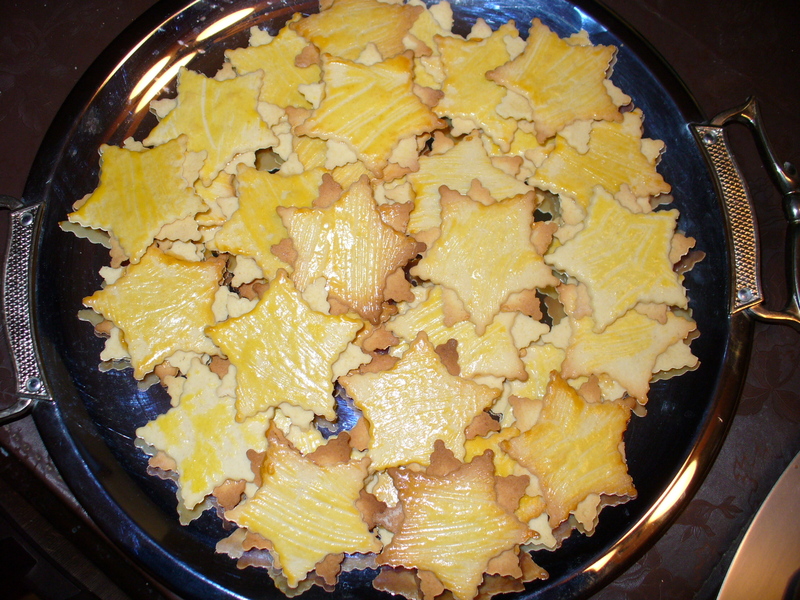 With my stars, I turn the top cookie, so the star points are offset (I just think it’s prettier that way) – see the photo. Allow the filling to set for a couple hours before putting the cookies away. Makes all the cookies you see here: about 3 dozen 2-layer cookies. Cream butter & sugar. Add molasses & coffee. Sift together remaining ingredients, and mix in. [Don’t forget to lick the beaters!] Chill. Roll dough thick (about 1/4″). 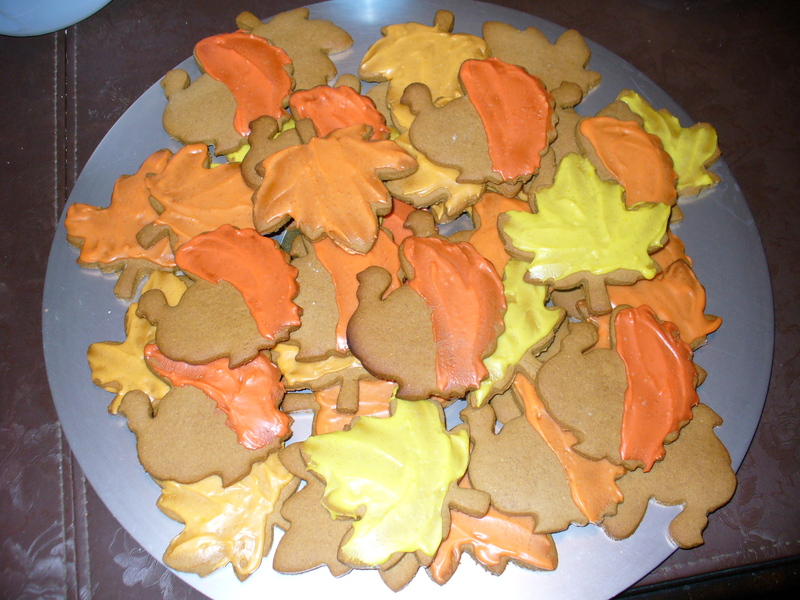 Cut in any shapes (I used leaves & turkeys this time, but I normally use this recipe for Christmas shapes). Bake 15 minutes @ 350F. Cool completely before icing generously with…. Add: 1/2 tsp vanilla extract & about 1 Tbsp water. Mix thoroughly to saturate the powdered sugar. Add water a very little bit at a time, till it’s the right consistency to spread. Tint with food color – a drop or two will usually do. Congratulations on making TIG! I had submitted you for those great looking cookies. The cooking baking day was great. Now how about a pasta making day?Maybe pasta "cushions" stuffed with pumpkin? I have made butternut-squash stuffed ravioli with sage-butter sauce & fresh parmigiano, yummy!!! Do you have a pasta machine? Manual or electric? Or just roll by hand? If you have a machine, can you recomment it? I researched one listed on Craigs List but comments said that the blades rusted after the first use. Do you use a pasta stamper for the ravioli? I have a manual pasta machine; the brand is Imperia, made in Italy. Looking on this page, it appears I have a Model 150. My husband gave it to me I'm guessing almost 10 years ago (after our first trip to Italy, where the cugini taught me how to make pasta). I've never had any trouble with rusting – although I've never washed it in water – per the manufacturer's recommendation. You just shake out the little bits of dough that might remain each time before putting it away. This pasta maker comes with a double cutter, to make either narrow or wide pasta, which is what I normally make. To make ravioli, you roll it in sheets with the pasta maker, and then I have a VillaWare ravioli maker.